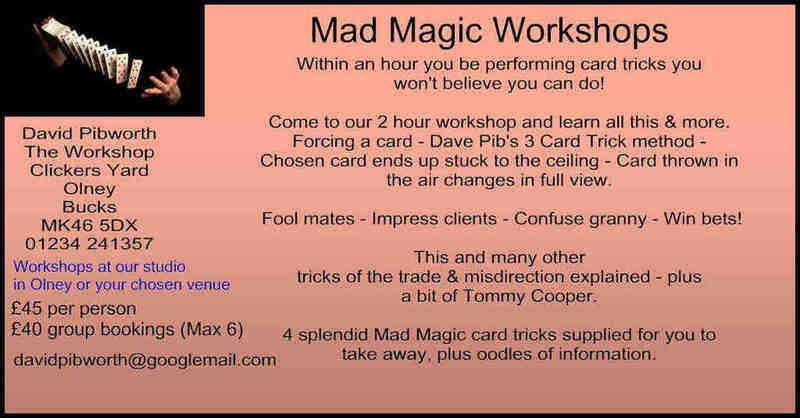 If you want a magic workshop, or a bit of individual tuition, then do give me a call. My daughter and I sit at the kitchen table as the nights draw in, working on little bits of magic and misdirection for fun. I love to hear the views of young people. "That fun usually creeps into my magic workshops"
I teach eccentric and comedy magic to the Pauline Quirke Academies all over the country and was in Evesham again on Saturday. I really enjoy teaching for these academies. I instruct the students how to make items disappear and reappear in unlikely places. It's all relatively easy from a technical perspective, but it's the misdirection and the banter that they really love and of course they're all potential performers so it helps them gain confidence. None of the gags I ever perform are long. Card tricks need to be short and sharp to maintain attention. I have a fantastic three card trick where the victim never picks the card he thinks he has. It's brilliant and more importantly, easy to perform with no chance of them knowing how you do it. One of my specialities is making things disappear. Silks, sweet packets, cards, you name it, I've got a way to do it. They also love it when I open a book or my wallet and it bursts into flames, but there are also safety issues to be addressed with these gags. The same applies with pushing a sword through their necks, and it's all part of the workshop. But the tricks that you can do, apparently off the cuff, are the ones that are the best. I've even got one now where you can make a card appear into your mobile phone, and it's really simple. All you need is a pack of cards, a mobile phone and an app which costs £2.83. And me to teach you the best way to do it. I'm now going to do some Corporate Magic workshops as I really think that if you can bring some humour into business, then it can help. Not in all instances of course. If you're a high court judge, just about to sentence a bank robber, you don't want to interrupt the proceedings by doing a short routine with cups and balls, but in many cases, it can be a great ice breaker. I'm just working on a gag where anyone who asks for my business card is offered a choice of 3 normal playing cards (as in the three card trick) and when they turn over the chosen card, it has my name and details on it. "I'm just perfecting it, but give it a month and ask me for my card and that's what you'll get"
So there you are, if you want a magic workshop, or a bit of individual tuition, then do give me a call on 01234 241357 or click here to send me an email enquiry. You can come to our Olney offices, or I'm happy to travel and the fun is guaranteed.